Although the number of attendants was down for the Clubs annual Ladies Night and Installation of officers for 2012-2013, the spirit of enthusiasm and dedication expressed by everyone present was very tangible. A popular and respected member, Norman Reside, was welcomed back with his wife Elinor, a dedicated couple who have supported the Westport Lions Club in many ways over the years. The loss of their son, Larry and Norman’s recovery from serious surgery has been a trying time and everyone was encouraged to have them present. 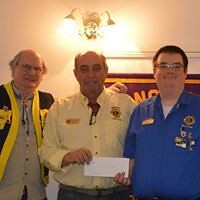 It was also an excellent time to honour Lion Don Baker with the Lion of the Year Award, a title he has earned with the many Club projects he was involved in. He has worked non-stop in many areas that have benefited both the Club and the community. Especially for his idea of setting up the Metal Recycle Dumpster and with the help of Lion Dwain Smith, it became a popular spot for local people to donate things that were excess around their home, garage or farm. All the metal brought into recycle netted the Lions Club a good bit of extra cash and provided a means of cleaning up what had become a nuisance in peoples yards and buildings. It has been moved to the Lions Trailer Park property at the end of their property and although must be kept locked, a phone call to either Don Baker at 613-273-2721 or Dwain Smith at 613-273-8896 and they will arrange for it to be unlocked in order that you can make your delivery. Following the delicious meal prepared by the caterer, Jeannette Harper, an installation ceremony was held for new officers. 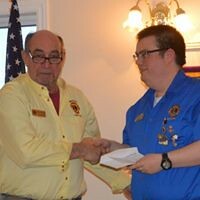 Lion Wayne Bent presented retiring president Lion Jim McGlade with a book of the years publicity, compiled and written by Lucille Bresee, who due to illness was unable to attend. The new slate of officers for 2012 – 2013 was installed by Lion Rick McCauley of Perth Lions Club who is Vice Governor of District 4-A Lions Clubs. 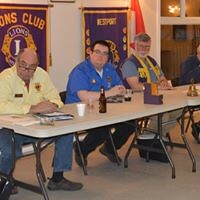 The slate consists of President; Rick Warriner; first Vice President, Lion John Rempel; second Vice President, Lion Don Baker; third Vice President, Lion Dwain Smith; Secretary, Lion Mike McIntyre and Bob Lavoie; Treasurer, Lion Bob Weir; Directors are: Lions Norman Reside, Kevin Kardash, Bob Reddick and Wayne Bent. 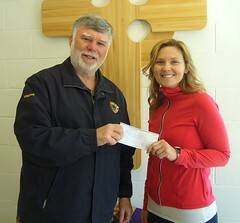 Lion Dwain Smith was honoured with an appreciation award for his outstanding support of the Westport Lions Club. The Mobility Van continues its’ excellent ongoing service for people of this community as they travel to hospital and other medical appointments. This busy schedule is headed up by Lions John Rempel and Bob Weir and assisted by Lions volunteer drivers. The Club is once again privileged to assist the Athens Lions Club as they hold their annual Farmersville on July 20-21 and 22. This popular event draws a huge crowd from all over Eastern Ontario and a lot of volunteers are needed to keep everything running smoothly. Also, Jim McGlade announced that the Money Calendars, representing the Club and including scenes from this immediate area, are again a good fundraiser. They are available at Murphys Shop or any Lions members and make an excellent Christmas gift.